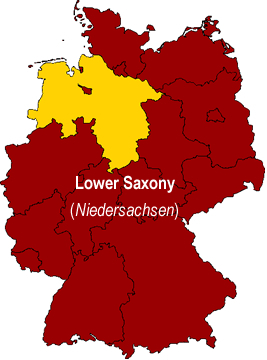 The state of Lower Saxony (Niedersachsen) lies in the northwestern part of Germany. It is the second largest state, after Bavaria, in size. The state is bordered by the German states of Bremen, Hamburg, Mecklenburg-Western Pomerania (Mecklenburg-Vorpommern), Brandenburg, Saxony-Anhalt (Sachsen-Anhalt), Thuringia (Thüringen), Hessen, North Rhine Westphalia (Nordrhein-Westfalen), and Schleswig-Holstein, as well as the Netherlands and the North Sea. Within Lower Saxony you will find beautiful countrysides, mountainous regions, flatlands, the North Sea coast, as well as the Lüneburg Heath (Lüneburger Heide) region, the largest heathland area of Germany. The state is committed to nature conservation: more than 20 per cent of the state's area has been designated as protected. Agriculture and farming make up a large part of the economy here. Because of its diverse landscape, a variety of products flourish here, including wheat and other grains, potatoes, asparagus, lettuce, kale, and carrots, as well as livestock (beef, pork, poultry). Automobile manufacturing, as well as automobile parts manufacturing, is another important aspect of the local economy. Volkwagen has five production plants as well as its world headquarters in Lower Saxony. Cooking in Lower Saxony (Niedersachsen) can be described as down-to-earth and hearty. The cuisine takes advantage of the regions diverse landscape - from coastal regions to grasslands to mountainous regions. Many foods are grown or produced locally and these make up a large part of the cuisine. In the coastal areas, seafood, such as crab, mussels, mackerel, trout, and eel, is a major part of the cuisine. In the grasslands close to the coast, black and white cattle provide the basis for the locally produced cheeses, such as Harzer Käse (Roller), and other dairy products, such as fresh buttermilk. In the north western region of the state, wurst and cured meats are the specialty. It is here that the internationally known Braunschweiger Wurst is produced. Lower Saxony is known as Germany's largest orchard. Here, a large variety of fruits are grown and harvested, including apples, Zwetschgen, and cherries.Lower Saxony is also the home of many breweries, some of which date back to the Middle Ages. A local specialty is the Bockbier. In Frisia and Eastern Frisia (Ostfriesland) (in the northwestern part of the state on the coast of the North Sea) tea is the beverage of choice, so much so that a tea culture has developed. This region alone consumes one-fourth of Germany's entire tea imports. Here, strongly brewed tea (one that has brewed for at least 3 minutes) is served with candied sugar and whipped cream in fine china. The cream must be allowed to simply melt into the tea - the local tea customl dictates that the tea must not be stirred. A minimum of three cups is usually consumed. 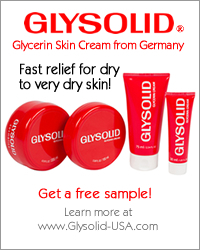 A list of popular foods and dishes in Lower Saxony (Niedersachsen) are listed below. The five largest cities (in terms of population) of the state of Lower Saxony (Niedersachsen) are listed below. Hannover is the capital city of Lower Saxony. It is also the largest city in the state, with a population of 515,000 (as of June 2006). Hannover is well-known for its CeBIT convention, the world's largest computer convention, and for the Hannover Convention, the world's largest industrial convention. Braunschweig is the second largest city in Lower Saxony. It has a population of 245,000 (as of January 2006). Osnabrück, the third largest city in Lower Saxony, has a population of 163,000 (as of January 2006). It was founded in 780 AD by Karl the Great as a bishop home. Lower Saxony's fourth largest city is Oldenburg, which has a population of 158,000 (as of January 2006). Oldenburg is committed to the northern German tradition of the Cabbage Ride (Kohlfahrt). In this tradition, participants wander from restaurant to restaurant and eat the local specialty, Grünkohl. Various drinking and sports games are played. Even a Cabbage King and Queen are nominated, who are responsible for planning the following year's Cabbage Ride. Göttingen, with a population of 129,000 (as of January 2006), is Lower Saxony's fifth largest city.